There are lots of teething products and aids out there. Alligator Dental has a standard regimen that we recommend to work through the teething blues. Pain medication, teething toys and Orajel are our major lines of defense. However in recent years other items have come on the market. These include Amber necklaces. Do these things really work? There is no scientific proof that these necklaces work. While I personally do not recommend them I can sympathize with parents who are loosing sleep and anxious to help their child find relief. 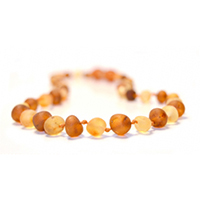 In this case you can give them a try – and see how the Amber necklace works for your child.